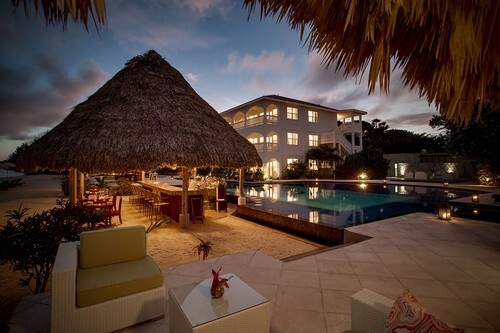 ENJOY ALL THAT THE BELIZE OCEAN CLUB HAS TO OFFER!! This first class Condo Hotel unit has the best location on the beach, just a step from the resort pool and breathtaking waters of the Caribbean Sea. The lagoon and majestic Mayan Mountains of Central America are on the western side of the Resort, offering spectacular sunsets. Located on the ground floor, this luxurious 2 bedroom, 2 bath, fully furnished condo includes marble floors, air conditioning, and cable TV. The exquisite European designed bathrooms have glass vessel bowl sinks, a large tub for relaxing, and a separate custom tiled shower. The fully equipped kitchen boasts granite counter-tops, stainless steel appliances, a full size refrigerator, stove with oven and a microwave. Off the kitchen is a separate dining area with comfortable seating for six. Step into the living room and relax on the sofa. Open the French doors to the private covered terrace and listen to the soothing sounds of the Caribbean Sea. In a single day you can travel from the tropical forest, to the Mayan Mountains, and back to the Caribbean Sea. Or snorkel and dive along the longest barrier reef in the Western Hemisphere with crystal clear waters and colorful ocean life to observe. Numerous land and water tours are available with professional tour guides that are natives of Belize. Fish, dive, swim, snorkel, hike, water tube, bicycle, kayak, or simply relax. With a diversity of opportunities unmatched by any other country, this is a true adventurer's paradise and less than a two hour flight from the USA!